Traditionalists often get a bad reputation. Many people will see us as "eccentric." A lot of it we bring on ourselves when we exalt apparitions and other private revelations over dogma and the teachings of the approved pre-Vatican II theologians. Some of it comes when we are affiliated (wrongly) with some strange people or groups who claim ties to Traditionalists or attempt to engage us in argumentation so as to persuade us to join them. I will discuss three such individuals/groups that should be avoided at all costs. If someone asks you about them, I hope to arm you with enough information so that you can explain why they have nothing to do with Traditionalists, nor do they represent our theological positions. I wrote about this individual twice before (see my posts of 6/22/15 and 6/29/15), but I bring him up yet again because I was informed that he misrepresented my remarks (he did) and claimed that I (along with Fr. Cekada and Bp. Sanborn) would "not answer" three questions he poses. The fact is everyone ignores him because (at the risk of sounding uncharitable) he needs (a) prayers for conversion, (b) a decent education, and (c) lithium. He is a "Vatican II Feeneyite," i.e., he not only accepts the heresies of Vatican II and the post-Vatican II "popes", but he denies Baptism of Desire (BOD) and Baptism of Blood (BOB) as being sufficient for Church membership and salvation without Baptism with water. Unlike the "Dimond Brothers" at Most Holy Family Monastery who are sedevacantist-Fenneyites and twist the teachings of the Church beyond recognition regarding BOD and BOB, Andrades has a twisted theory that is as ridiculous as it is amusing and pathetic. He attempts to salvage both Vatican II and Fennyism by making a distinction between "visible/invisible" and "implicit/explicit." According to Andrades, since no one can see the dead, we don't know if anyone is in Heaven without Baptism in water, so BOD and BOB are "implicit" and hypothetical. Likewise, when Unitatis Redintegratio of Vatican II claims that Christ uses Protestant sects as a "means of salvation," we can't see the dead, so it's hypothetical for us in 2015 and is consistent with pre-Vatican II ecclesiology. He claims you can read the documents of Vatican II with "Cushingism" (his neologism for Richard Cardinal Cushing, the Archbishop of Boston who condemned Fr. Feeney) and "Feeneyism." He even makes obviously historically inaccurate remarks, such as BOD and BOB without being followed by Baptism with water started with the Baltimore Catechism in the 19th century. (I guess he never read St. Thomas Aquinas expounding on the subject written in the 13th century; and I can go back much farther.). It is a dogma of the church that all need the baptism of water for salvation. It is not a dogma of the Church that BOD is sufficient and must exclude the baptism of water. We answer to your question: The presbyter who died without the water of baptism, since he persevered in the faith of Holy Mother Church and in the confession of the name of Christ, we affirm without any doubt that he became free of the original sin and reached the joy of eternal life" (Denzinger n. 388--Emphasis mine). We answer saying that the baptizer and the one who receives baptism must be different persons, as we infer from the words of the Lord when, speaking to His Apostles, He said: ‘Go, baptize all nations in the name etc (Matt 28:19). Therefore, the mentioned Jew must be baptized again by another person to show that one is the baptizer and another is the one who receives the baptism. … Nonetheless, if he would have died immediately, he would have flown instantly to the celestial homeland for his faith in the Sacrament rather than for the Sacrament of the Faith "(Denzinger n. 413--Emphasis mine). The Code of Canon Law is a universal disciplinary law and cannot teach error. It was promulgated by Pope Benedict XV. Anyway these cases are hypothetical.You and Bishop Sanborn do not know of any specific case. So how can you assume in principle that there are persons saved as such or going to be saved as such when you do not know and cannot know of any specific case?. How can you make a theoretical rule when no one in Church in history could know of any case? "January 23: At Rome, St. Emerentiana, a Virgin and Martyr. She was just a catechumen when she was stoned by the Gentiles while praying on the tomb of St. Agnes, who was her foster-sister." "April 12: At Braga in Portugal, the martyr St. Victor, who, although only a catechumen, refused to adore an idol, and confessed Jesus Christ with great constancy. After suffering many torments, he was beheaded, and thus merited to be baptized in his own blood." "June 22: At Verulam in England, in the time of Diocletian, St. Alban, martyr, who gave himself up in order to save a cleric whom he had harbored. After being scourged and subjected to bitter torments, he was sentenced to capital punishment. With him also suffered one of the soldiers who led him to execution, for he was converted to Christ on the way and merited to be baptized in his own blood. St. Bede the Venerable has left an account of the noble combat of St. Alban and his companion." "June 28: At Alexandria, in the persecution of Severus, the holy martyrs Plutarch, Serenus, Heraclides a catechumen, Heron a neophyte, another Serenus, Rháis a catechumen, Potamioena, and Marcella her mother. "(All emphasis above in the Roman Martyrology is mine). We know they died as catechumens. We know catechumens are unbaptized or they wouldn't be called catechumens had they received the sacrament with water. They were "baptized in their blood" and are listed as saints in the authoritative Roman Martyrology . It can't be wrong because the Church is infallible in declaring people saints. Otherwise, we might be praying to the damned; such is unthinkable. So here are your specific cases, Mr. Andrades. If they can happen then they can happen in 2015! Second, Andrades sounds like a bad inverse of the movie The Sixth Sense---"I can't see dead people!" The most important principle he won't acknowledge is that hypothetical statements can be heresy! If someone said "Christ COULD commit sin" this is heresy because Christ is God, and God can't go against His Own Nature. It doesn't matter that we can't see Christ commit sin, so it's only invisible and implicit for us in 2015. It's heresy. Likewise, I can flip Andrades weird verification criteria on him. In 1950, Pope Pius XII canonized St. Maria Goretti. He couldn't see her in Heaven; he can't see the dead. No one can see her now in 2015, so how do we know she is in Heaven? By the authority of the Church! The same Church that authoritatively decrees that four catechumens are saints in Heaven baptized by there own blood. No "seeing the dead" is needed. When Vatican II states Protestant sects are a "means of salvation" you'll never find proof because it can't happen---but just as "an hypothesis" it is heresy, as it contradicts the True Faith. 1.Baptism of desire (BOD) is not relevant to EENS. So why does Fr. Anthony Cekada say the Slaves of the Immaculate Heart of Mary religious, at the St. Benedict Centers USA, are in mortal sin for not accepting BOD with reference to EENS. It has nothing to do with Extra Ecclesiam Nulla Salus (EENS) "Outside The Church There Is No Salvation." It has to do with HOW membership is obtained. St. Benedict Center denies BOB and BOD as understood by the Church and are in mortal sin. 2.The SBC say they accept BOD and it will be followed with the baptism of water.These are hypothetical cases. Why does Fr. Cekaga(sic) consider hypothetical cases as being exceptions or relevant to the dogma EENS? Once again, it has nothing to do with EENS. BOD is sufficient in and of itself. They deny Church teaching. Hypothetical statements can be heresy. 3.So why does the professor at the sedevacantist seminary make this claim that they are in in mortal sin? Is he not wrong? No, he is not wrong. Mr. Andrades will continue to repeat the same drivel, and accuse those who disagree with his heresy "illogical" and "irrational" even after all this has been explained to him. It won't register. I wonder how he considers his "popes" not heretical since they can't see the irrationality and preach near universal salvation in a one-world religion. JPII, Benedict XVI, and now Francis, would all disagree with him. If they are irrational, they can't be popes, for habitual insanity precludes one from holding papal office. If they are not irrational and perpetrate this alleged error, they are heretics and can't be popes. The Holy Ghost is supposed to guide the "pope", but Lionel Andrades is better guided (so he thinks). Do not engage this man. Pray for him. Unlike most conclavists who think they can elect a "pope" anyway they choose (e.g. David Bawden aka "Pope" Michael), this group has started a new sect based on private revelations. On March 30, 1968, a group in Palmar de Troya, Spain began claiming supernatural revelations from apparitions of the Blessed Virgin Mary. The Blessed Virgin was supposedly giving messages regarding the Antichrist, and a man named Clemente Dominguez became the "official seer" of Palmar de Troya. He claimed to have received the "stigmata" (Wounds of Christ), but one only needs to look at the photos to see it looks like he squirted himself with ketchup. He attracted quite a following, including some rather wealthy people who contributed large sums of money. He contacted Archbishop Peter Thuc, who fell for the story, and in January 1976, Abp. Thuc ordained and then consecrated Dominguez and four of his friends as priests and bishops using the Traditional Rite of the Church. Abp. Thuc was "excommunicated" by Montini (Paul VI) and then reconciled, before breaking away to ordain some sane men as bishops in this time of near Universal Apostasy. Dominguez didn't understand Latin and had no formal training, so "Mary" conveniently revealed that Spanish was God's favorite language after Latin, and Spanish could be used in the Mass and sacraments.Dominguez lost both his eyes in a car crash, and it was revealed that when Montini died, he would be the next pope as "Gregory XVII." God would publicly restore his sight after he became "pope" on TV so all would know he was the true pontiff. He then said "Mary" revealed what some have called the "crooked ears theory." Montini was a good and holy pope, but had been drugged and locked up in a closet shortly after his election by Masons. They had one of their own replace him by using plastic surgery to look like him, and that's how Vatican II was promulgated. If you look at photos before and after 1964, you will supposedly notice that post January 1964 photos show him with crooked ears--an imperfection that the Masons overlooked and "proof" of this goofball story. After Montini died, Dominguez was "mystically crowned pope" by Christ Himself, and called the First Palmarian Ecumenical Council. Things got super-weird at this point. Every priest in his sect was also a bishop. Since Dominguez had no training and attempted to translate the rites into Spanish, his ordinations and consecrations are dubious at best. He declared that Palmar de Troya and not Rome, would now be the seat of the Church (the pope must always be bishop of Rome--this is heretical). His "Palmarian Creed" declared Mary the "Irredeemed," for She who is without sin had no need of redemption (Pure heresy. Pope Pius IX, in his infallible declaration on the Immaculate Conception Ineffabilis Deus, declared that Mary was redeemed "in view of the merits of Jesus Christ"--in a unique manner prior to His death, which God knew with certainty would happen). He declared John XXIII, Paul VI, and Francisco Franco as "saints." He is accused as having molested several of the nuns in his sect before he died in 2005. His successor, Manuael Alonso Corral, succeeded him as Peter II, but he died six years later. He was succeeded by the currently reigning “pontiff” – Sergio Maria – who took the name Gregory XVIII. Dominguez was "canonized" as "Pope St. Gregory the Very Great." They have proclaimed the "real presence" of Mary in the Host with Christ, and the bodily assumption of St. Joseph, as dogmas. At the present time, the Palmarian church claims to have 60 bishops, 70 nuns, and 2,000 followers. "1. Woman may not wear trousers. 46. Christmas presents must be given and opened on the feast of the Epiphany"
Some of these rules (banning horoscopes) make sense, but others (no voting) are without justification and are not based on sound principles of moral theology. Mixing good and bad is something the True Church cannot do. Moreover, even the slightest breach of a rule will result in "excommunication." Some were told they had to leave their spouse if he did not adhere strictly to the dress code even around the house! A group of clergy were dismissed by Dominguez before he died, and now operate as independents--sedevacantist Palmarians!! This group of people are living in New Mexico under a seriously deluded man named Richard Ibranyi. He was formerly associated with the "Dimond Brothers" of NY (and mentioned above). Ibranyi rejects all popes "from Innocent II (1130-1143) onward as apostate antipopes because they are idolaters or formal heretics and hence not Catholic." (RJMI’s Position & Authority, Current version: 1/2014--See http://www.johnthebaptist.us/jbw_english/ ) He gets together with some of the "brothers" and they decide by private interpretation, and having no formal education, whether each pope has committed heresy. He has denounced St. Alphonsus, St. Thomas Aquinas, St. Thomas More, St. Bernard, St. Vincent Ferrer (and many others) as heretics. In his own words from his website: "I reject all the so-called popes from Innocent II (1130-1143) onward as apostate antipopes because they are idolaters or formal heretics and hence not Catholic. I believe in the deeper dogma that non-Catholics cannot hold offices in the Catholic Church. For an in-depth profession of the Catholic faith, see The Catholic Church’s (sic) Profession of Faith, compiled by RJMI (the initials of his entire name--Introibo)." His beliefs change at the speed of light. As of 2012, he accepted all Popes up to Pope Pius IX and all Councils up until Vatican I (1870). He rejected Pope Leo XIII as the first "antipope." He claims to be called as the "witness of the Apocalypse." From his site: "I will now address the portion of the… letter that disputed my claim of being one of the witnesses mentioned in the book of the Apocalypse, Chapter 11. I will start with a question: Would you believe me if I said, “Yes, God has called me to be one of the two witnesses mentioned in the book of the Apocalypse?” Does God’s choice depend upon the approval of [a certain group]… or, for that matter, of anyone else? Cannot God choose whom He pleases? Or does God need the recommendation of [a certain group or people]… to confirm the mission He has called me to fulfill. … God has called me to be one of the two witnesses mentioned in the book of the Apocalypse. Does that mean this is true? Yes, if I continue to do God’s will; and no, if I do not continue to do God’s will. If I disobey God and fall away from the faith, then I will prove to be unworthy and forfeit the mission God has given me. I am well aware of the fact that if I disobey God, He would annul the mission He has called me to fulfill. Over the years, starting in 1986, God has been testing me by fire and bringing me along this long road to prepare me for the day when this mission will directly oppose the Antichrist. … Some believe that Elias must return in person as one of the witnesses mentioned in the Book of the Apocalypse, Chapter 11. This is not true. John the Baptist fulfilled the prophecy of the coming of Elias to prepare the world for the first coming of Jesus Christ. An angel and Jesus Himself said that John was Elias, meaning John was filled with the same spirit of Elias… The same applies to the mission God has given me as one of the witnesses mentioned in the Book of the Apocalypse, Chapter 11. My mission is to expose and attack the Antichrist and his minions and his evil kingdom and to convert good-willed men, many of whom will be Jews, by turning their hearts to the one and only true God, the Catholic God, and to usher in the Second Coming of Jesus Christ. Therefore, I am not Elias but am filled with the spirit of Elias!" Need I even comment on this farce? As Traditionalists, we are what's left of the Roman Catholic Church, since the Great Apostasy of Vatican II. We base this on sound theological principles, and hold on to the Faith as understood and practiced by all true Catholics from 33 AD to the death of Pope Pius XII in 1958. You can see that the groups above are not educated and base their beliefs on private revelations, self-made hermenutics of interpretation, and grandiose ideas of self-importance. Ibranyi's group resides in a New Mexico city called "Truth or Consequences." It's fitting. If the above individuals, who have turned a deaf ear to the Truth don't repent, they (and their followers) may receive the horrible consequences to come. Introibo, you write: "The Code of Canon Law is a universal disciplinary law and cannot teach error. It was promulgated by Pope Benedict XV." Hmm, I think you're making a fallacy of composition here. A compendium of laws is not itself a law. Benedict XV promulgated not a universal law, but the codification and simplification of existing laws. Nor does it seem reasonable to say that he was promulgating all the laws contained in the code. First of all, since they already existed, that means they were already promulgated and in force. Moreover, there were over 2,400 laws in in 1917 code. Are you suggesting that the pope himself reviewed every one of them? No, it doesn't seem reasonable to assume that each item in such a collection should be covered under the infallibility of the pope who promulgates it, unless you can cite an authority that proves me wrong. Thanks for your comment. A preliminary remark:According to the teaching of the Church, She is infallible (without any error) in Her Universal disciplinary laws and practices, and has declared that She cannot issue a practice which is evil and harmful to the Faithful. This has been taught by both the pre-Vatican 2 popes and the approved pre-Vatican 2 theologians. According to theologian Zubizaretta, "Corollary II. In establishing disciplinary laws for the universal Church, the Church is likewise infallible, in such a way that She would never legislate something which would contradict true faith or good morals. Church discipline is defined as 'that legislation OR COLLECTION OF LAWS which direct men how to worship God rightly and how to live a good Christian life'...Proof of the Corollary. It has been shown above that the Church enjoys infallibility in those things which concern faith and morals, or which are necessarily required for their preservation. Disciplinary laws, prescribed for the universal Church in order to worship God and rightly promote a good Christian life, are implicitly revealed in matters of morals, and are necessary to preserve faith and good morals. Therefore, the Corollary is proved." (See Theologia Dogmatico-Scholastica, 4th Edition, Vitoria: El Carmen 1948; 1:486). As you can see "collections of laws" are protected by the Church's infallibility. Lest, someone object that the Code is not "universal" because it does not bind the Eastern Rite Catholics, when a canonist calls a law universal,he is not referring to it applying in the Latin and Eastern rites simultaneously. Rather, he is referring to a law's extension, i.e., the territory where it has force. Thus a particular law binds only within a certain determined territory. A universal law, on the other hand, binds throughout the whole Christian world. (See theologian D. Prummer, Manuale Juris Canonici (Freiburg: Herder 1927). Therefore, The Church's infallibility covers (a) collections of disciplinary laws that are (b) universal and (c) promulgated by the pope. The 1917 Code is a collection of disciplinary laws, which are universal and promulgated by Pope Benedict XV. Conclusion: The 1917 Code of Canon Law cannot teach error. It clearly teaches Baptism by Desire (BOD) in Canons 737 and 1239. Therefore, BOD must be true. As an aside, the Eastern Rites pre-Vatican 2 ALL had similar provisions in their disciplinary codes. The whole Code must be true, otherwise, some canons would be true and good, while others would be evil and erroneous. How would we distinguish the two types? You would have two canons clearly teaching a falsehood; something Christ will not permit His One True Church to do. It is also not necessary for Pope Benedict 15 to read every canon, any more than it was necessary for Pope St. Pius V to read every word of the Missale Romanum, or Pope Pius XII to "see" the soul of Maria Goretti in Sanctifying Grace at the moment of death. That's where the protection of God the Holy Ghost comes in. Notice that notorious Freemason Hanibale Bugnini composed the revised Holy Week rites of 1955. Pope Pius XII promulgated them. I know of not one Traditionalist who claims the changes were per se evil or heretical. They are not. However, they lead some to believe the rites of the Church could be changed on a whim and they lead to what was truly evil years later; things Pope Pius XII couldn't foresee. That is why some Traditionalists (Society of St. Pius V) has gone back to the pre-1955 rites, while others (CMRI) keep the 1955 rites since they are not evil per se. The Holy Ghost at work. Had Bugnini given Pope Pius XII the 1969 Novus Bogus, not only would he have NOT promulgated it, Bugnini would have been excommunicated vitandus and stripped of all ecclesiastical offices. That's the difference between a POPE (Pius 12) and a Satanic JOKE (Bergoglio aka "Francis"). So, was the Church wrong for 2,000 years in treating the unbaptized as if there was no hope for their souls? If you accept the 1917 Code as infallible, you’d have to say yes. So, according to Pius XII here, the unbaptized are neither Christians nor members of Christ. Hmm, I don’t see anything here that justifies them being “reckoned as baptized.” Do you? Again, the unbaptized are not members of the Church. But there’s no salvation outside the Church, right? So where is the justification here for treating the unbaptized as if there was hope for their salvation? After reading these quotes, I’d have to say: Council of Braga 2 - 1917 Code 0. The problem with that view, which, under the circumstances, I do not consider heretical, is this: First, the two theses are more irreconcilable than the proponents imagine. Second, the first thesis is expressly taught in magisterial pronouncements of the highest authority. The second shows up here and there in documents of less authority, or (as in the case of the 1917 Code) in documents that are not primarily magisterial. The first problem suggests that both theses cannot be rationally held. The second suggests which of the two ought to be chosen. There are several problems with your objections that show them to be without merit. 1. The same 1907 Catholic Encyclopedia teaches BOD just a few paragraphs later. Were the editors schizophrenic in not seeing a contradiction between the former practice and BOD? They obviously did not see it as mutually exclusive. 2. The major problem is that your same argument could be used against the Latin Rite for refusing the Chalice to the Faithful. Since the Church never prohibited the faithful receiving the Chalice for hundreds of years, does that make the new law erroneous or heretical? For over a thousand years, the Church always gave infants Communion with Baptism. Did Rome err for contradicting the entire history of the Church when it changed the law? Both of these laws are tied to the Faith, too. Many more examples could be given, but these suffice to show that the former practice of Communion under both kinds did not "better show the Real Presence" than Communion under one species. Just receiving the Host did not derogate from the Faith. Likewise, the Church decided to give ecclesiastical burial to those who died as catechumens, not because BOD was not believed, but to emphasize it. Communion under one Species was given not because the Whole Christ was not believed to be present in either species, but to emphasize it (among other reasons of practicality). 3. Because a Church law, which is tied to the Faith, changed after so many years doesn’t imply that it’s heretical, unless of course, the law was previously condemned as heretical or intrinsically evil, which, of course, is impossible lest the Gates of Hell prevail. 4. The consequences of rejecting the Canon Law of the Church is damning because the application of the law involves the practice of the Church. We have funeral masses for catechumens. You would have to say that these pre-V2 Masses lead to impiety because they imply BOD and would necessarily lead one to believe in BOD. If anyone says that the ceremonies, vestments, and outward signs, which the Catholic Church uses in the celebration of Masses, are incentives to impiety rather than the services of piety: let him be anathema [cf. n. 943]. Can. 7. The Council of Trent, Session XXII, (D. 954). 5. Pope Pius XII is quite correct that the unbaptized are not members of the Church. However, BOD is a miracles of Grace whereby the recipient receives the Faith and Sanctifying Grace, AT THE MOMENT OF DEATH. Since there are no living persons who have received BOD walking around, the unbaptized we meet are not part of the Church and must be converted because we cannot depend upon a rare miracle of God to save them. The real problem George, is that you do not accept the infallibility of the Church in promulgating universal disciplinary laws. Unless you agree with the outcome, the canon is defective because it conflicts with your private interpretations of "real infallible decisions" and you reject the Church's approved theologians whom are authorized by the Magisterium to correctly interpret and show the consistency of ALL Church teaching. The 1907 Catholic Encyclopedia assumes BOD cases are personally known and so are relevant to all receiving the baptism of water. BOD cases would have to be personally known to be relevant and an exception to the dogma extra ecclesiam nulla salus(EENS). This is a common mistake. 5. Pope Pius XII is quite correct that the unbaptized are not members of the Church. However, BOD is a miracles of Grace whereby the recipient receives the Faith and Sanctifying Grace, AT THE MOMENT OF DEATH. Fine. No problem here. It is theoretical and it is a possibility if God wants it. Since there are no living persons who have received BOD walking around, the unbaptized we meet are not part of the Church and must be converted because we cannot depend upon a rare miracle of God to save them. "As Traditionalists, we are what's left of the Roman Catholic Church"
Traditionalist" is not a vague word when I have defined my term beginning with my first post. We have the same Faith and Morals as all Catholics prior to the death of Pope Pius XII in 1958. The people I mention hold ideas contrary to the Faith pre-Vatican II. Hence, the "true Scotsman" accusation has no merit. What's being done to get everyone on the same page? Hopefully, an imperfect general council to elect a new pope. However, this can only be done under specific circumstances; there is no "quick fix." As far as the "word cloud" is concerned, all I can say is the time-honored expression, "Hey, if the shoe fits...."
I wonder how he considers his "popes" not heretical since they can't see the irrationality and preach near universal salvation in a one-world religion. JPII, Benedict XVI, and now Francis, would all disagree with him. The popes, like the sedes accept Cushingism ( there are exceptions to the dogma) and reject Feeneyism( there are no exceptions). They accept the irrationality and heresy of the Baltimore Catechism. "Catholic Mission" is Mr. Lionel Andrades written about above. I allow almost anything to be written by commentators as long as it is charitable and uses no profanity. I said not to engage Mr. Andrades because he is unstable, and these comments of his simply prove my point, so I allowed them to be posted. As you can see, he clearly doesn't understand what was written about BOB and BOD. So, one last time!! The doctrines of BOB and BOD do not run counter to the dogma "Extra Ecclesiam Nulla Salus" (Outside the Church No Salvation) because BOD and BOB are sufficient of them selves and without the sacrament of Baptism (by water) to get a soul into the Church and saved AT THE MOMENT OF DEATH. Several popes, saints and catechisms teach BOTH the absolute necessity of water baptism under NORMAL AND USUAL CONDITIONS, as well as BOD and BOB in extraordinary cases. These sources are explaining the difference between the ordinary and extraordinary. Something is either Catholic or it is not. The teaching that Baptism by water must follow BOD is not Catholic. It does not matter if we can see the dead--it is contrary to the Faith. I cannot see Christ in 2015, but I know the statement "Christ COULD commit sin" is heretical, since He can't. To say God can't save apart from water baptism with BOD and BOB is likewise heretical, since He CAN. The official catechisms of the Church are infallible--protected by the universal and Ordinary Magisterium of the Church. The Catechism of Pope St. Pius X specifically teaches BOD and BOB. So does the Catechism of the Council of Trent (which predates Baltimore by hundreds of years). To claim otherwise is to say the Church could officially sanction and teach heresy (the very word you used to describe the Baltimore Catechism). Then Pope St. Pius X was a heretic and could be neither pope nor saint. Ditto for Pope St. Pius V who promulgated the Catechism of Trent. The great Doctor of the Church, St. Alphonsus Liguori, wrote, "Now it is de fide (of Faith) that men are also saved by Baptism of desire, by virtue of the Canon Apostolicam, "de presbytero non baptizato" and of the Council of Trent, session 6, Chapter 4 where it is said that no one can be saved 'without the laver of regeneration or the desire for it'." --See Moral Theology, Book 6, nn.95-7, "Concerning Baptism." Was St. Alphonsus using 'Cushingism"? I doubt it. The great Saint and Doctor of the Church died in 1787, before Cushing was even conceived and before the Catechism of Baltimore was written. . Furthermore, he knew all the dogmatic facts about baptism, so he would be a formal heretic claiming you can be saved with BOD not followed by Baptism of water. How did a heretic become an infallibly canonized saint? That would make Pope Gregory XVI who canonized him a heretic as well, for he knew what St. Alphonsus taught. The only irrationality and heresy COMES FROM YOU. The dogma does not mention BOD and BOB.it says all need the baptism of water. Fr. Leonard Feeney said the same. and without the sacrament of Baptism (by water) to get a soul into the Church and saved AT THE MOMENT OF DEATH. If there was such a case it would be known only to God.It is hypothetical for us.So we can accept this but not assume it is relevant to the dogma. SInce it is not a defacto, explicit case. Several popes, saints and catechisms teach BOTH the absolute necessity of water baptism under NORMAL AND USUAL CONDITIONS, as well as BOD and BOB in extraordinary cases. These sources are explaining the difference between the ordinary and extraordinary. With reference to BOD and BOB, only hypothetically for us and known in reality for God can there be an ordinary and extra ordinary means of salvation. For us humans there cannot be an extraordinary means of salvation since there are no known 'extra ordinary' cases.There are no known exceptions to all needing the baptism of water, which is the ordinary means of salvation. Something is either Catholic or it is not. The teaching that Baptism by water must follow BOD is not Catholic. It does not matter if we can see the dead--it is contrary to the Faith. The dogma says all need the baptism of water! Wrong! The dogma as INTERPRETED BY YOU says all need baptism of water. That was not the teaching of St Thomas Aquinas, St. Alphonsus, all the pre-Vatican II theologians and Pope St. Pius X in the very Catechism he wrote! I am referring to the text of the dogma . See the text of Cantate Dominio, Council of Florence 1441 for example. It does not mention the baptism of desire. Cantate Domino does not mention it because it's not addressing it! If you knew how to read and could understand the context (as well as what the theologians teach) the Bull is referring to those who DO NOT WANT to be in the Church! BOD and BOB are for those who want to be members. If they are irrational, they can't be popes, for habitual insanity precludes one from holding papal office. Would this also apply to Bishop Sanborn and Fr,Anthony Cekada? They use the same irrational reasoning as the popes. 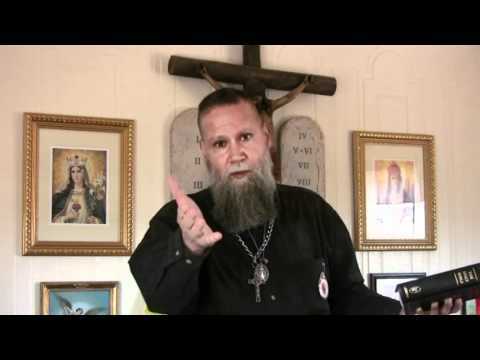 This is the standard error being taught at the Most Holy Trinity Monastery, Florida. See the above. The only error and irrationality comes from YOU. 2. The Palmarian Churchm Mary's Remnant. Why have you placed me with these groups ? I do not claim to have had visions. I have not founded a new church. I am just a blogger. I go for Mass in the mainline churches in Rome. I am a lay man. You are a Vatican II Fenneyite (the worst kind). You follow the post- Vatican 2 "popes" who are manifest heretics and have indeed created a new sect. They will accept your "Cushingism" and "Fenneyism"--anything EXCEPT the Truth. The "mass" you attend (Novus Bogus) is invalid as are all V2 "sacraments" except most baptisms and some marriages (where no phony annulments are issued. You are a heretic and spread your falsehoods using bizarre ideas ("Cushingism, seeing the dead as a test for truth, etc.) that clearly puts you in the same category as the others for kooky notions trying to pass for Traditional Catholicism. Lionel:Cushigism,this is your concept of BOD being an exception to the dogma. You are a Cushingite. For me there are no exceptions, I am a Feeneyite. For the Church Councils which defined the dogma there were no exceptions. They were Feeneyites. Traditionalist Catholics before 1808 were all Feeneyites. that clearly puts you in the same category as the others for kooky notions trying to pass for Traditional Catholicism. No, I am a Traditionalist Catholic, you are a Vatican II Fenneyite heretic. Was St. Alphonsus a heretic using "Cushingism"? How about Aquinas? How about Pope St. Pius X? You reject the teachings of the universal and ordinary Magisterium as defined by Vatican I. So many times I have repeated on my blog and Twitter in our discussions that I do not deny the baptism of desire or blood as being sufficient for Church membership. Firstly they are iinvisible for all of us and so we can ONLY accept them as being hypothetical cases known only to God. Secondly they would have to be followed by the baptism of water since this is the dogmatic teaching i.e extra ecclesiam nulla salus. Introibo: Wrong! He admits in his second point that BOD and BOB are NOT sufficient for salvation but they must be followed by baptism of water. This is heresy. As I wrote above:The doctrines of BOB and BOD do not run counter to the dogma "Extra Ecclesiam Nulla Salus" (Outside the Church No Salvation) because BOD and BOB are sufficient of them selves and without the sacrament of Baptism (by water) to get a soul into the Church and saved AT THE MOMENT OF DEATH. Several popes, saints and catechisms teach BOTH the absolute necessity of water baptism under NORMAL AND USUAL CONDITIONS, as well as BOD and BOB in extraordinary cases. These sources are explaining the difference between the ordinary and extraordinary. He never addresses this point. Andrades: There is no dogma which says we have to accept the baptism of desire and blood without the baptism of water and Catholic Faith. Introibo: Wrong! Vatican I taught: "...by Divine and Catholic Faith, all those things are to be believed which are contained in the written word of God and in Tradition, and those which are proposed by the Church, either in a solemn pronouncement or in Her Ordinary and Universal teaching power, to be believed as divinely revealed." (See DENZ. 1792) BOD and BOB without Baptism with water falls under the infallibility of the universal and ordinary Magisterium. A Traditionalist (or one who claims to be "Catholic") and rejects Vatican I; that he only believes in dogmatic pronouncements, but not those proposed as divinely revealed by the universal and ordinary Magisterium is a heretic. This mean you Lionel Andrades. Ask yourself, "Why would the popes teach anything non-ex cathedra if the faithful are not bound to follow it, and it could be in error or heretical?" What kind of "teaching authority is that? Richard Ibranyi's video on the SSPX is 100% correct.Other than that I disagree with him on most everything. Contrary to Andrades who claims Catechisms teach error, they are protected by the universal and ordinary Magisterium of the Church. They cannot teach error. The Catechism of Pope St. Pius X (written by this great saint) clearly teaches BOB and BOD without Baptism of water. This would make St. Pius a heretic. How can a heretic be both pope and saint? A heretic can't be such, so either Andrades must claim St. Pius is neither pope nor saint OR BOB and BOD without water baptism is true. Andrades: While St. Thomas Aquinas said that all need the baptism of water for salvation. Secondly, the sacrament of Baptism may be wanting to anyone in reality but not in desire: for instance, when a man wishes to be baptized, but by some ill-chance he is forestalled by death before receiving Baptism. And such a man can obtain salvation without being actually baptized, on account of his desire for Baptism, which desire is the outcome of "faith that worketh by charity," whereby God, Whose power is not tied to visible sacraments, sanctifies man inwardly. Hence Ambrose says of Valentinian, who died while yet a catechumen: "I lost him whom I was to regenerate: but he did not lose the grace he prayed for." Lionel Andrades is ignorant of the teachings of Aquinas, as I have just proved!!! Andrades: It is true that the baptism of desire is mentioned in the Council of Trent and it is a response to the campaign may be scores of years earlier to get rid of the dogma extra ecclesiam nulla salus. There are many popes who mention the baptism of desire and say apologetically that the person can be saved with the baptism of desire. Why had they to say this ? Since there were the Masons, Americanists and others who wanted to create confusion and ambiguity with reference to the dogma on exclusive salvation in the Church. Introibo: The Catechism of Trent was promulgated in 1566. The Freemasons were founded in 1717, the United States in 1776. Americanism arose in the 1800s. How could his two boogeymen, Masons and Americanists do anything in 1566 as they did not yet exist? How can a pope promulgate something that is a detriment to the Faith? They CAN'T! "For the Spirit of Christ has not refrained from using them as means of salvation which derive their efficacy from the very fullness of grace and truth entrusted to the Church"
He refers to all needing the baptism of water for salvation, why don't you quote that passage. I have come across the quotation so many times on Internet forums, 'the laver of regeneration'.Even your readers will know about it.So why are you saying I am wrong? Secondly, the sacrament of Baptism may be wanting to anyone in reality but not in desire: for instance, when a man wishes to be baptized, but by some ill-chance he is forestalled by death before receiving Baptism. This is your inference.Your intepretation. And such a man can obtain salvation without being actually baptized, on account of his desire for Baptism, which desire is the outcome of "faith that worketh by charity," whereby God, Whose power is not tied to visible sacraments, sanctifies man inwardly. But St. Thomas Aquinas did not say this. This is your interpretation. It is not there in the text. Hence Ambrose says of Valentinian, who died while yet a catechumen: "I lost him whom I was to regenerate: but he did not lose the grace he prayed for." The text does not say that St. Ambrose saw the man in Heaven without the baptism of water. There is no text in the writings of St. Thomas Aquinas in which he says that the baptism of desire refers to explicit cases. The text instead says if there is a man in the forest God will send a preacher to him. He will baptised. The Catechism of Trent was promulgated in 1566. The Freemasons were founded in 1717, the United States in 1776. Americanism arose in the 1800s. How could his two boogeymen, Masons and Americanists do anything in 1566 as they did not yet exist? How can a pope promulgate something that is a detriment to the Faith? They CAN'T! The enemies of the Church were there long before that date. Do not put a fixed date upon them. There were secret societies and lobbies who opposed the Church even before the official date of the founding of the Masons. The devil existed over the centuries and has opposed the Church. If you assume this is a reference to an explicit, known person or persons , then this would be a case of 'seeing the dead'. If you assume that this is a hypothetical, theoretical case for us and known only to God,.then it would not be relevant to EENS. AND I QUOTE "Secondly, the sacrament of Baptism may be wanting to anyone in reality but not in desire: for instance, when a man wishes to be baptized, but by some ill-chance he is forestalled by death before receiving Baptism. And such a man can obtain salvation without being actually baptized, on account of his desire for Baptism, which desire is the outcome of "faith that worketh by charity," whereby God, Whose power is not tied to visible sacraments, sanctifies man inwardly. Hence Ambrose says of Valentinian, who died while yet a catechumen: "I lost him whom I was to regenerate: but he did not lose the grace he prayed for." Do you know how to read? I haven't seen one citation from you. When Aquinas says,"... when a man wishes to be baptized, but by some ill-chance he is forestalled by death before receiving Baptism. And such a man can obtain salvation without being actually baptized" How is that my interpretation? Again, "SUCH A MAN CAN OBTAIN SALVATION WITHOUT BEING ACTUALLY BAPTIZED" ! Can we see those saved in Protestant sects? NO!! Why not? They don't exist! For me they do not exist too. You must be a Traditionalist Catholic to be saved, so even if you could "see the dead" they wouldn't be among the saved! You need to be a Catholic to be in Heaven. So if there is a theoretical reference to a Protestant saved, it is a hypothetical case. Of course when the person is in Heaven it would be with Catholic Faith ( St. Thomas Aquinas/St. Francis Xavier). The ordinary means of salvation for baptised Protestants, is the Catholic Church, with the Sacraments and the traditional Church teachings on faith and morals. They could be saved hypothethically with Catholic Faith. They would then be Catholics in Heaven. And what authorities can you cite for "Satan" influencing the Catechism of Trent? None! Your whacky idea. The whole purpose of having a pope is to prevent error from being taught through Satanic forces. Therefore, either St. Pius V and St Pius X were heretics and not popes, or their catechisms are Truth! The Baptism of Desire refers to invisible cases. This is common sense. If a pope or saint says otherwise it would be wrong. The fact that we don't know them does not mean God cannot and does not save without baptism of water. He saved St. Emerentiana and St. Victor who were catechumens by BOB without Baptism with water. The Church clearly teaches this in her Martyrology and her LITURGY which is infallible! You are a heretic and irrational. Introibo: Wrong! There are NO CASES visible or invisible because members of false sects CAN'T be saved. A member of a false sect, before dieing could become a Catholic. When he is in Heaven he would be saved as a Catholic. He could convert like so many have done. They would be saved. V2 is teaching that the SECTS and their heresies are a "means of salvation." It does not mean individuals can convert and be saved that is YOUR INFERENCE. NEVER has the Church taught that SECTS are a "means of salvation" before V2! St. Thomas Aquinas held the Feeneyite version of extra ecclesiam nulla salus. Your quote on St. Thomas Aquinas above only refers to implicit desire for the baptism of water/ baptism of desire. We agree it is theoretical. St. Thomas Aquinas does not say in your quote above that these cases are explicit. He does not say in your quote that these cases are exceptions to the dogma. You assume the baptism of desire is explicit and an exception to the dogma and then pin it on St. Thomas Aquinas.This is what the liberal theologians also do. So where is the text? St. Thomas held the Catholic version of BOD and BOB. He died well before the excommunicated Fr. Feeney! Your citations are cherry-picked by the Vatican II sect Feeneyites, "Slaves of the Immaculate Heart of Mary." Notice what I said many times before: Popes, Saints and theologians teach BOTH the absolute necessity of water baptism AND Baptism by Desire!! Aquinas wrote, Secondly, the sacrament of Baptism may be wanting to anyone in reality but not in desire: for instance, when a man wishes to be baptized, but by some ill-chance he is forestalled by death before receiving Baptism. And such a man can obtain salvation without being actually baptized, on account of his desire for Baptism, which desire is the outcome of "faith that worketh by charity," whereby God, Whose power is not tied to visible sacraments, sanctifies man inwardly. This is a direct quote from the Summa Theologica as well!! Was Aquinas schizophrenic? No, he was distinguishing the ORDINARY means and the EXTRAORDINARY means. There's the text! See my summary reply to you in the comments section of my most recent post: "A 'Laver Of Regeneration' No More"
May God enlighten you to see the Truth! Today Mr. Andrades has responded to this blogpost but somehow he thinks that you are Eric Gajewski (Tradcathknight). Mr Andrades is incapable of rational argument. I'm not saying this to be uncharitable or boorish. He has issues and I'm not a doctor. I pray for him and his conversion. I'm not Tradcathknight, nor do I have any dealings with him. The only websites I endorse are Daily Catholic, Novus Ordo Watch and Speray's Catholicism in a Nutshell. The Cardinal Of Boston, pre-Vatican II during the Fr Feeney debacle. He was a closet Modernist who came out as such during the Great Apostasy.